Let’s start off this post with a wow. 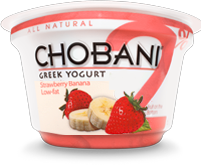 I just reviewed Chobani’s new strawberry banana greek yogurt, and thought it was quite tasty. So, I figured, why not also try the 0% raspberry flavor (which Chobani just happened to send me 😛 ) ? I am happy to say, I have one of my new favorite flavors of yogurt! Overall, this Raspberry Chobani deserves 5 stars. It really is one of the best greek yogurts I have had. Surprising to me, because I’m not a *huge* raspberry fan- I often think they are a bit bitter and I prefer juicy strawberries or apples (Chobani- come out with an apple flavor- please!!). But definietely try this yogurt! 1 yogurt is 140 calories, 0 grams of fat, 22 carbohydrates, 1 gram of fiber, and 14 grams of protein. Cultured Pasteurized Nonfat Milk, Evaporated Cane Juice, Raspberries, Natural Flavor, Locust Bean Gum, Pectin, Fruit and Vegetable Juice. Amy’s Kitchen has made a Sheperd’s Pie that is meatless, gluten AND dairy free. 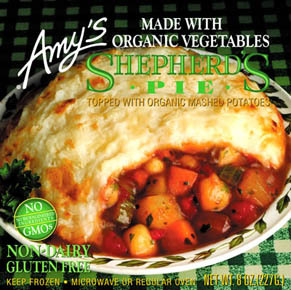 Amy’s says this Sheperd’s Pie has “organic vegetables in a nourishing broth blanketed with smooth mashed potatoes”. This meal also has only 4 grams of fat, no cholesterol, and is completely and 100% natural. So I followed the microwave instructions and popped this pie in, let it sit for 2 minutes as directed, and popped it on out. I decided to have it with some Trader Joe’s soy nuggets & applesauce, because I had a feeling a little vegetable pie would not be enough to satisfy my raging hunger after an afternoon run. After 5ish minutes or so, a little bit of the filling oozed out into the packaging, but nothing I couldn’t handle lick off the wrapper. I decided to try just the top first-the mashed potatoes. They were super fluffy with a real homemade taste. The potatoes were nice and creamy, and almost had a whipped-like consistency. There were garlic and onion flavors that also complimented the potatoes nicely. Onto the filling-assorted vegetables consisteing of bits of mushrooms, carrots, celery, garbanzo beans and tomatoes. It sort of reminded me of vegetable soup- the taste, not the consistency. It had a tomatoey-based taste, mixed with some spices, which included a dash of black pepper. This pie was packed with these veggies, that were all tender and nicely cooked, The carrots were not as tender, and had a bit more of a bite to them. In my opinion, I liked that the carrots were slightly less soft than the rest of the veggies- mushy carrots are for baby food jars! 😛 The filling also had a slightly salty and garlicy flavor, but overall was very tasty. What’s YOUR favorite Amy’s Product? Let me know!! 1 pie is 160 calories, 4 grams of fat, 27 carbohydrates, 5 grams of fiber, and 5 grams of protein. That’s why I jumped for joy when I was asked to review their all natural Honey Almond Butter and Dark Chocolate Peanut nut butters. A dream come true for a nut butter fanatic like myself. As soon as I got the package in the mail, I opened it, took out my notebook, and put my taste buds to work! Honey Almond Butter- First of all, there’s some cute pics on the jar. I love when a company jazzes up the jars- it makes the experience that much better. First, there’s a cute cartoon almond dressed up with a briefcase, as if he’s going to work or something, saying “Li’l bit sweet!”. Then there’s a cartoon cracker chasing a bee with a net and a jar- adorable! This nut butter had a rich, roasted almond flavor, and just a wee bit of honey flavor. Not too sweet at all, just a hint of honey was left on the tongue. It actually reminded me of cashew butter, which is sweeter than most nut butters. It had that “stick to the roof of your mouth” consistency we all know and love. It was a bit runny, even after putting it in the fridge for a few days, so I think it would be great to drizzle over oatmeal, cereal or waffles. Dark Chocolate Peanut- one of the new flavors by Maranatha, this one may not have cute cartoons, but it certainly doesn’t disappoint. Overall, these get 4 1/2 stars. I love how they are all natural, with no trans fats, and don’t have any refined sugars. Maranatha now has a new place in my cupboard next to my other (more like 25 other) nut butters. I can’t wait to try more of their flavors! Honey Almond Butter- 2 Tbs. is 180 calories, 14 grams of fat, 9 carbohydrates, 3 grams of fiber, and 6 grams of protein. Dry Roasted Almonds, Organic Honey Crystals (Organic Evaporated Cane Juice, Organic Honey, Organic Cane Molasses), Sea Salt. Dark Chocolate Peanut- 2 Tbs. is 180 calories, 13 grams of fat, 12 carbohydrates, 1 gram of fiber, and 5 grams of protein. Dry Roasted Peanuts, Evaporated Cane Juice, Palm Oil, Canola Oil, Cocoa Powder (alkalized), Non-fat Dry Milk, Soy Lecithin, Natural Vanilla Flavor, Salt. One of my favorite companies Chobani sent me an e-mail asking to review one of their new flavors, Strawberry Banana 2% Greek Yogurt, a try. Honestly, HOW could I say no? 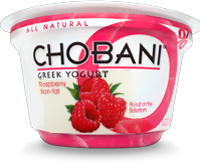 Being the yogurt lover that I am, and seeing how much I adore Chobani Greek Yogurt, I knew this one HAD to be good. I reviewed some of their yogurts in the past, and loved them! Check them out here. At first I was a little taken aback- 2%? Is that necessary? Fat Free Greek Yogurt is already super creamy- How can it get any better?? The Strawberry Banana 2% is amazing! I actually LOVED the addition of real cream as one of the ingredients along with milk- it really made a difference and brought such a dessert-like consistency and flavor to the yogurt. It was super creamy, with a few itty bitty strawberry chunks in it. The flavor was rockin’ too. A nice blend of strawberry AND banana (yes, both!). Neither were more overpowering- which I often find happens when you get mixed fruit yogurts. You taste one flavor predominantly over the other, and the company might as well not have bothered mixing the flavors together to begin with. Not the case here- the strawberry flavor was real and so was the banana. I hate the “fake” tasting banana (think- LAFFY TAFFY), but this tasted like actualy bananas were pureed and put in the yogurt. By itself, it’s not too sweet, just right in my opinion, and was certainly satisfying. I had this new Chobani with sliced strawberries, dark chocolate almond granola (courtesy of Cascadian Farm), a drizzle of dark chocolate dreams (courtesy of PB&CO), and a sploosh of whipped cream. Ahh, what a DECADENT breakfast it was. What’s your favorite Chobani Flavor? Let me know which one’s to try!! 1 cup is 160 calories, 3 grams of fat, 19 carbohydrates, 1 gram of fiber, and 14 grams of protein. Cultured Pasteurized Nonfat Milk, Evaporated Cane Juice, Strawberries, Bananas, Natural Flavors, Locust Bean Gum, Pectin, Fruit and Vegetable Juice (for color). 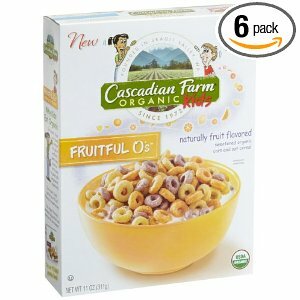 Cascadian Farm makes tasty foods, ranging from cereals, granolas, frozen foods, cereal bars, etc. that are all organic. According to Cascadian Farm, “Our organic foods are grown without the use of synthetic pesticides, chemical fertilizers or genetically engineered ingredients.” This also means no preservatives or nasty artificial colors or flavors. As a bonus– the companies farming methods help protect and preserve our environment. Way to be, Cascadian Farm! So I went to Waldbaums the other day and I went to pick up my usual cereals, when I spotted this new cereal Fruitful O’s. They were naturally fruit flavored, instead of artificially flavored. I decided to revel in my childhood and buy a box. It was a bit pricey, all organic food usually is, but I wanted to try this new cereal. So, I opened up the box when I got home and poured myself a bowl. They came in colors yellow, orange and purple. I really liked how the serving size was 1 cup and still only had 120 calories. Plus, there was a LOT of Fruitful O’s in my bowl with just 1 cup! The taste was actually quite good, however it was much better in some vanilla almond breeze or skim milk than dry. When they were dry, they were sweet and crunchy, with a mostly orangy fruity flavor. However, when I had them with milk or almond milk, the flavors really shown through, and they wer actually sweeter. Normally when I add milk to my cereals, I notice it gets soggy fast and the flavor disperses in the milk. This didn’t happen as quickly with this cereal. I usually have a method for this, as I like my cereal when it’s a tad soggy from the milk, but still has a crunch. I measure out how much I want, put half in a bowl (usually with a sliced banana), add the milk (and ice cube, of course! 😉 ) and then I add more cereal as I go along. Keeps the flavor and the crunch going! Overall, I was impressed. Cascadian Farms’ brand is also made with whole grain oat flour and has 3 grams of fiber per serving. There is also no partially hydrogenated oils or artificial colors/dyes. I give Fruitful O’s 4 stars. I think it’s good to mix in with some higher fiber cereals, or to have a bowl as a snack (the cereal alone probably won’t hold you over very long). 1 cup is 120 calories, 1 gram of fat, 27 carbohydrates, 3 grams of fiber, and 2 grams of protein. It is also fortified with vitamins and minerals, like calcium (10% per bowl), iron (25% per bowl) and zinc (35% per bowl). Whole Grain Oat Flour, Corn Meal, Sugar (from cane), Tapioca Syrup, Oat Fiber, Wheat Starch, Sea Salt, Sunflower Oil, Color (elderberry juice concentrate, turmeric and annatto), Fructose, Natural Flavor. Who doesn’t like waffles, pancakes or french toast? Yea- not feeling many responses there. I haven’t met a person who doesn’t love waffles, pancakes OR french toast. Perfect to wake up to in the morning, for an afternoon snack, or even breakfast for dinner with some scrambled eggs. Topped with maple syrup, yogurt, fresh fruit, whipped cream, ANYTHING, these 3 are a sweet indulgence. However- they are time consuming to make. AND- there’s only so many EGGO waffles a girl can consume in her life (and there’s a lot of icky ingredients in those boxed frozen brands anyway). They have a bunch of varieties too. For the pancakes, there are Fluffy Buttermilk Pancakes, A+ Cinnamon Whole Grain Spelt Pancakes, All Natural Whole Grain Pancakes, Blueberry Whole Grain Organic Pancakes, and Flaxseed Buckwheat Berry Pancakes. And lastly, there is Whole Grain Cinnamon French Toast. Of the varieties, I was lucky enough to try…. and the A+ Cinnamon Whole Grain Spelt Waffles. Much different than your standard frozen waffle. Square in shape, you get 3 sets of waffles per serving. If you are used to hard and crispy waffles, these are quite different. VERY soft, even after toasting them in the toaster oven, they got crispy edges, but remained fluffy and soft on the inside. A unique experience for me, but definitely a good one! 🙂 The Apple Cinnamon Flaxseed Waffles were sooo good. They had a buttery taste to them, with a mixture of cinnamon and sugar, and then a slight granny smith apple after taste. They were sweet, super fluffy, and really delicious. I really enjoyed these, and it’s an easy way to get some flaxseed into my diet! 😉 They were a little high in fat, but it only had 1 gram saturated per serving, so most of it was healthy fats. 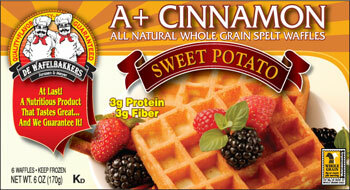 Onto the winner of the review, the A+ Cinnamon Whole Grain Spelt Waffles. Honestly, the name says it all. A PLUS. A+ !!!! These were THE BEST WAFFLES I HAVE EVER EATEN IN MY LIFE. My stomach/ brain/taste buds were in love (so was my nose with the excellent smell surrounding my kitchen). They are made with sweet potatoes, which was SO delectable with the cinnamon flavors. It provided a sweet, yet savory flavor, that was just perfect. I could eat these breakfast, lunch and dinner!! Overall, I’m giving the pancakes 4 stars, and the waffles 5 stars. I REALLY enjoyed the waffles the most. They were unique, delicious, nutritious and absolutely divine. I love how they are made with whole wheat flours, and have other health benefits such as the incorporation of flaxseed, inulin, spelt flour, buckwheat flour and Fructan (Nutraflora) (see website for details). The only negatives I came up with was that there are refined sugars/corn syrup in a few of the flavors, some a tad high in fat, and some lack fiber and protein. However, a few modifications (add some fruit, add some yogurt or scrambled eggs, etc.) can make these a perfect, delicious, round-about meal. I haven’t tried the French Toast yet, but I will soon (and let you guys know how it is of course), and I’ll be hunting down the other waffle flavors as well!! Blueberry Pancake- 2 pancakes is 180 calories, 6 grams of fat, 33 carbohydrates, 5 grams of fiber, and 3 grams of protein. 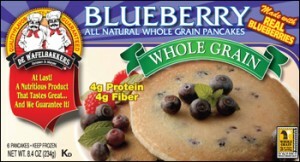 Organic Whole Wheat Flour, Water, Organic Evaporated Cane Juice, Organic Canola or Organic Soybean Oil, Organic Blueberries, Fructan, Whey, Protein Concentrate (milk), Salt, Organic Egg, Whites, Soy Lecithic (Emulsifier), Leavening (Sodium Acid PyroPhosphate, Sodium Bicarbonate), Natural Blueberry Flavor, Natural Butter Flavor, Xanthan Gum. Contains Egg, Milk, Soy, Wheat. Buckwheat Berry Pancake- 2 pancakes is 140 calories, 4 grams of fat, 31 carbohydrates, 6 grams of fiber, and 4 grams of protein. Whole Wheat Flour, Water, Sugar, FlaxSeed Meal, Buckwheat Flour, Soybean Oil and/or Canola Oil, Fructan, Egg Whites, Whey, Dried Mixed Berries, Salt, Leavening (Calcium Acid Pyrophosphate, Monocalcium Phosphate, Sodium Bicarbonate), Soy Lecithin, Natural Berry Flavor, Natural Vanilla, Xanthan Gum. Contains Egg, Milk, Soy, Wheat. Apple Cinnamon Waffle-3 waffles is 210 calories, 11 grams of fat, 27 carbohydrates, 4 grams of fiber, and 4 grams of protein. Whole Wheat Flour, Sugar, Egg Whites, Water, Rice Bran Oil and/or Canola Oil, Flax Seed Meal, Apple flavor-ettes, (sugar, corn syrup, corn cereal, modified food starch, vegetable oil, natural flavor, caramel color, malic acid), Dried Apples, Fructan, Cinnamon, Lecithin, Whey, Salt, Xanthan Gum, Leavening (Calcium Acid Pyrophosphate, Sodium Bicarbonate), Vanilla. Contains Egg, Milk, Soy, Wheat. A+ Cinnamon Spelt Waffle– 3 waffles is 190 calories, 9 grams of fat, 24 carbohydrates, 3 grams of fiber, and 3 grams of protein. Whole Wheat Flour, Whole Grain Spelt Flour, Egg Whites, Sugar, Water, Sweet Potatoes, Rice Bran Oil and/or Canola Oil, Fructan, Lecithin, Soy Flour, Whey, Cinnamon, Salt, Leavening (Calcium Acid Pyrophosphate, Sodium Bicarbonate), Xanthan Gum. Made with Bruce Foods Sweet Potatoes. Contains Egg, Milk, Soy, Wheat. Browsing the dairy section at my grocery store looking for new things to pop in my fridge (as IF there was ANY room available), I spotted something truly beautiful & tempting. Alas- some simple math calculations arose in my head. Stonyfield Farm + Organic Yogurt + Maple Vanilla + NEW PRODUCT = ONE HAPPY LISA! The Maple Vanilla is the newest addition to Stonyfield’s line of low fat and fat free organic 6 oz cups of yogurt. It’s only available for a limited time (of course, I ALWAYS like the limited addition flavors. Do we recall my post on the Pumpkin Pie flavor by Stonyfield?). So far, I had the Maple Vanilla 2 ways- once slightly frozen, and once as is. Both ways were delightful, indeed. The yogurt is creamy- one of the reasons I love Stonyfield’s blended yogurts is because they are CREAMY! They are not watery like those “diet” yogurts I have tried, and are not super thick like greek yogurt, but they are a happy medium between the two. A texture I really like, because I feel like I am actually eating something, not drinking something. The yogurt is mildly sweet, with just a hint of maple. I honestly felt there was more vanilla flavor than maple, and sort of wish there was a bit more maple flavor. Nonetheless, it was a delicious yogurt, and a real treat frozen. I give it 4 stars. I also had the yogurt with some cream of wheat, maple syrup and sliced bananas, and it was one DELICIOUS breakfast! 1 yogurt is 130 calories, 1.5 grams of fat, 23 carbohydrates, 0 grams of fiber, and 7 grams of protein. It also has 25% daily calcium needs and those lovely probiotics! CULTURED PASTEURIZED ORGANIC LOW FAT MILK, NATURALLY MILLED ORGANIC SUGAR, ORGANIC MAPLE SYRUP, ORGANIC NATURAL FLAVOR, PECTIN, ORGANIC CARAMEL COLOR, ORGANIC NATURAL VANILLA FLAVOR, VITAMIN D3. With Easter approaching, I thought it would be a good idea to do a review of the new Gluten Free Cocoa & Vanilla Bunny Cookies that Annie’s Homegrown sent me to try. What better way to celebrate the holiday than with some of my favorite bunnies? (And Bernie, of course!) Even better- EVERYONE can have these this Easter– they are Gluten Free, all natural, and have 0 grams of trans fats! First off, I LOVE Annie’s Bunny Grahams- honey, cinnamon and chocolate chip are all so delicious, and are my favorites. Annie’s Bunny Grahams truly are ADDICTING, there is no way you can eat just a serving- too delicious! That’s why I was SO excited getting these in the mail. Cocoa and Vanilla sounds like a great addition to the line of flavors. Each Bunny Cookie is about the size of a quarter, in the shape of an adorable bunny (modeled after Bernie, Annie’s Homegrown bunny, of course!). I noticed that these were not as soft as the Bunny Grahams, and were a bit crisper/had more of a bite to them. The cocoa flavor reminded me of the outside of an Oreo cookie. Crisp and sweet, but had a deep cocoa/chocolate flavor. They were really good with the glass of milk I had, and smeared with some all natural peanut butter 🙂 Next was the vanilla flavor, which I preferred over the cocoa, as it was sweeter and more my style. It had a buttery taste to it, and reminded me of a sugar cookie with a little bit of vanilla bean added to it as well. Overall, these are a nice addition to the line of Bunny Grahams, and let those of you who cannot tolerate gluten enjoy some cute little Bunnies! 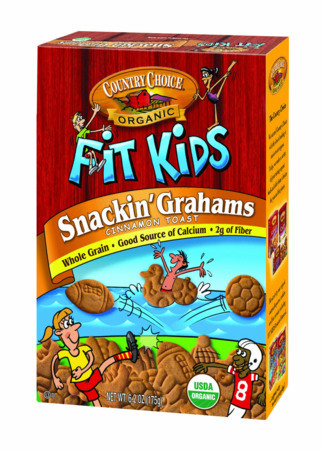 I’m givng them 4 stars overall– the only thing I didn’t like was that the first ingredient was cane sugar, and these are not enriched with calcium like the other varieties are. 🙁 Otherwise, like the box says, “You can’t eat just two”- I know I certainly can’t! So forget the junky Easter candy this year- get some Annie’s Homegrown Bunny Grahams or Cookies! You won’t be disappointed! 27 cookies are 120 calories, 3.5 grams of fat, 19 carbohydrates, 1 gram of fiber, and 2 grams of protein. CANE SUGAR, RICE FLOUR, YELLOW CORN FLOUR, PALM OIL, BROWN RICE FLOUR, CORN STARCH, SOY FLOUR, ORGANIC TAPIOCA STARCH, ORGANIC TAPIOCA SYRUP, ALKALIZED COCOA, NATURAL CHOCOLATE AND VANILLA FLAVORS, SALT, BAKING SODA, SOY LECITHIN, XANTHAN GUM. Rico M. Panada is a food company that makes delicious empanadas. What’s an empanada you ask? According to the company, an empanada is a “half-moon shaped turnover stuffed with a filling”. This company was founded by Ricardo Rezk, who came up with the idea of his empanadas as he saw Americans struggle with their pizza or burger on the subway on the way to work. They needed something delicious, conveinent, but still healthy. Alas! Rico M. Panada’s empanadas were born! These all natural, baked empanadas come in 6 flavors. Beef, Chicken Pot Pie, Black Bean & Beet, Sweet Corn & Cheese, Spinach and Tofu, and Red Beans & Rice. I was lucky enough to try the Chicken Pot Pie, Spinach & Tofu, and Red Beans and Rice varieties. I prepared all 3 of them in the microwave first, and then used the toaster over for a few minutes to crisp up the edges like the box suggests. They are all cute crescent moon shaped, plumped with some filling, and have a rigged edge on the crust. They are about the size of a hot dog bun, except fatter where the filling is, and skinnier toward the top. Overall, I enjoyed these, and I give them 4 1/2 stars overall. I paired mine with some applesauce (when do I not pair things with applesauce?) and some veggies for a light meal. You could also eat both with some veggies & another side, and have yourself a nice little dinner. The only thing I didn’t like was that only 2 come in a box! What’s a hungry girl to do when she AND her very hungry friends want the same flavor? (Well THIS hungry girl isn’t sharing, that’s for sure! :P) I reccommend trying these- I also want to try the sweet corn & cheese flavor- sounds interesting!! Spinach Tofu-1 empanada has 150 calories, 4.5 grams of fat, 24 carbohydrates, 3 grams of fiber, and 6 grams of protein. spinach, onions, water, tofu, organic wheat flour, organic whole wheat flour, canola oil, organic brown rice, garlic, kosher salt, lemon juice, herbs, spices. Red Bean & Rice-1 empanada has 180 calories, 4.5 grams of fat, 29 carbohydrates, 4 grams of fiber, and 8 grams of protein. Chicken Pot Pie- 1 empanada has 160 calories, 4 grams of fat, 22 carbohydrates, 2 grams of fiber, and 10 grams of protein. chicken breast, water, green peas, carrots, organic wheat flour, onions, organic whole wheat flour, canola oil, garlic, kosher salt, eggs, spices, herbs.